HOW TO TIE GELE – When you think about an occasion like a traditional or church wedding in Nigeria, a lot of images come to mind including that of a well-decorated space with a good number of tastefully dressed guests in addition to different groups of women, young and not-so-young, dressed in uniforms. One thing that is easily noticed about these women is that no matter the style of their clothes or the quality of their fabrics, each woman completes her dressing with a stylish headgear popularly called gele. But how many of them actually know how to tie ‘gele’ by themselves? Yes, gele is one of the most important aspects of a Nigerian woman’s dressing even though it is difficult for many women to tie, it is not impossible to do it yourself! 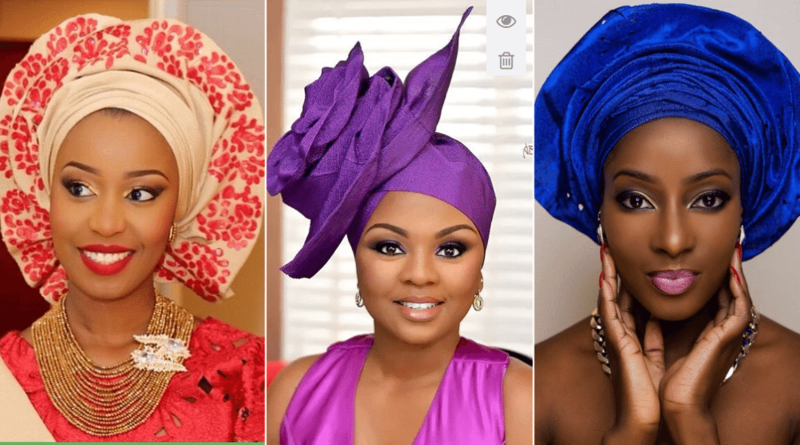 You might have seen glam pictures of Nigerian women donning the headgear littered all over the Nigerian internet space and you’ve been dying to learn how to tie gele. In this post, we will be showing you a simple step by step method of achieving this feat in addition to practical video tutorials that’ll be of help to you. In case you don’t know, gele tying has already become an art and many people have turned it into a business and are making cool money from it. You can also be a part of these entrepreneurs in the beauty industry or at least save yourself the time and money spent to get people to tie gele for you. Some time ago, Nigerian ladies abandoned using the head piece because of the complication involved in the often long process of tying it but this field of ‘creative art’ is back and better with many appealing styles. The history of wearing gele in Nigeria is traced to the Yoruba women who have been wearing it for as long as the oldest of their women can remember. As a result of long time use, they created some special methods of how to tie gele which we are about to share. So grab a seat and your gele as you watch yourself become a pro using these easy method of achieving your desired glam look. Note: Before you begin your casual or bridal gele, ensure that your hair is all packed in place. So if you have very long hair, put it up and fix it in a ponytail or a knot. You need a smooth foundation for the perfect gele. Once you put your hair up, also brush it well, concentrating mostly on the area of your forehead in order to put all flying hairs in check. Remember that the beauty of your gele lies in the smooth, clean look you are expected to have at the end of the process so we don’t want to have any stray hairs leaving their positions on your head and sticking out to the front thereby spoiling your effort. In order to take care of this, you can use any hair slides to set your hair in place or put on a cover, preferably, a wig cap. However, you can easily skip this step in case if you have very short or totally straight hair. But if you have a lot of hair or very smooth or silky hair, you are to use some additional head cover. Aside from a wig cap, using transparent African fabric also works very well, so you can create a much better foundation for your future African gele. This method helps it not to slide off your head. It also keeps your curly, fluffy hair down and tight perfectly well on your head. Now, down to the real deal of how to tie gele! 1.Begin by folding in the end of the gele, this will ensure there is a smooth base at the front (crown of your head). 2. Take the gele and wrap it around your head from the back to the front (towards the middle of your forehead) ensuring that the ends at the front are equal. This aspect is very important. 3. Then take one side of the gele, e.g: the left side, and wrap it towards your right all the way round to the back of your head and secure it with your right hand. At this point, the left side of the gele will be shorter than that of the right side. 4. Take the right side (the longer side) and cross it over to the left side all the way round the head to the back, wrapping it and securing it with your hands at the back. 5. At the side & back of the gele, begin to arrange it, measuring the gele around the head in levels and layer…begin to squeeze the ends to form a fan from the middle of the layout, ensuring that the left over at the end closest to you is enough to grip. 6. Repeat the same on the other side. 7. Secure the grip by typing both ends closest to you into a knot twice and neatly tucking in the loose bits. 8. At this point there will be 2 layers at the top of the gele piece. Start arranging the layer at the back first making sure the highest point of the gele is in the middle. 9. Then move to the layers at the front. Start making lines and pleats forming layered steps at the front of the gele with your fingers. Be sure to try to make them as defined as possible. 10. Push the gele back as desired away from the face to give the face a lift. Be sure not to push back excessively as to prevent the gele from falling off your head. Also be sure not to pull your ears out of the gele. The final step is to keep adjusting the gele until the desired result is achieved. Voila! That’s just how to tie gele… Simple right? This is the most popular basic and also the simplest method of tying an African gele. You can do it easily with no help at all. It just needs a little practice and time.